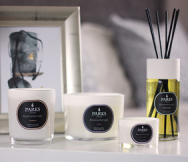 Our Fine Fragrances range of candles, room sprays and perfume diffusers includes some of the most exclusive and sought after scents available today. Fill your home with exquisite aromas that lift the mood and provide a sense of calm and relaxation for you and your family. Our candles feature rare and beautiful combinations, including Grapefruit, Tangerine and Vetiver - a unique blend in a stylish diffuser that offers weeks of refreshing and invigorating scents for the home. Try our Wild Fig and Cassis candle blend for a calming gentle experience – with hints of Orange Blossom, Sun-ripened Figs and Blackcurrants creating an aura of warmth and homeliness. Or indulge in calming Lavender and luxurious zesty May Chang, a refined fragrance with an air of grandeur and exclusivity.